Here it is. This is the what the reflection was. A Whooping Crane!! 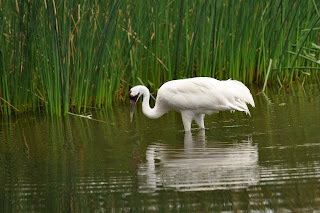 Linda and I went to the International Crane Foundation in Baraboo, WI. It is about an hour and a half from my folks cabin. I had read about this place on Michael Forsberg's website. These guys do great work. It is the only place in the world were you can see all 15 different crane species. There were 2 whoopers in this enclosure. I had seen a couple in the wild on the Platte River. But never this close. I believe there are only 500 of these guys alive in the world. 300 are in the wild. So it is worth the trip just to see them.